The Runrio's Run United Philippine Marathons (RUPM) series or simple Run United is one of the much-awaited major running events in the country. This is a trilogy wherein the runners were challenged to complete the three runs. 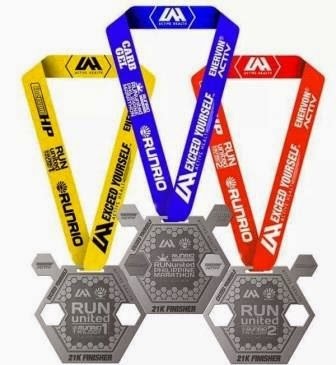 One of the things why runners love this trilogy run is the medal. Yes, the three medals which corresponds to the successful completion of the three runs were interconnected. Putting them together will form a bigger one seems like volt-in to one. What can you say about this year's medals?! Are you now more excited for RU?